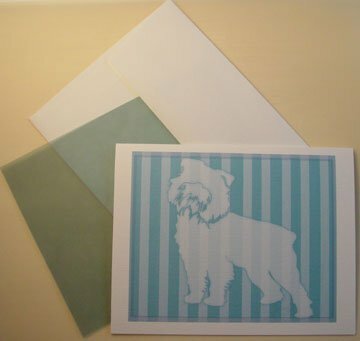 Brussels Griffon portrait silhouette Note-cards Aqua-blue stripes. Adorable set of 8 notecards printed on fine quality linen stock textured paper and set of linen textured envelopes; each notecard includes a delicate vellum lining for a beautiful presentation. Inside card is left blank for your special message. Size is approx. 4 1/4" X 5 1/2". Note-cards are gift packed in clear acetate box enhanced with delicate organza ribbon. Notecards can be personalized with name or phrase of your choice; personalized name can be place on the designed image or on the side ... your choice. A proof will be sent via email for your approval before printing. This beautiful set of notecards make great gifts! They can be use as thank you cards, invitations, get well cards, love or friendship notes. Copyright and Reproduction Rights to all pictures and art paintings displayed on Timeless Memories web pages are property of Ines Miller, image has been protected with Timeless Memories watermark seal; your original art piece won't have the copyrighted inscription.